– In the Outlook Express Address book select the first group and press CTRL-A to select all. – Drag and drop the contacts from the right of the address book that are all now highlighted onto the folder you created on the desktop. – All the .vcf entries are individual files, You want to get them into one big file so Start > Run > cmd and press enter. Your now in the DOS command prompt and by default it puts you on level below the Desktop folder so you should be able to just type: cd Desktop and press enter. – The type cd space and the beginning few letters of the folder you created and press tab, it will auto complete with the name of the folder provided its unique and not like anything else on the desktop, press enter. – Transport that all.vcf to the Windows 7 machine, its probably a few hundred k so a thumb drive or attaching to an email should be the quickest ways to get it over. Now to get that into a group in Outlook is not as simple as importing the file, unfortunately!! – On the Win7 machine click on the Start button and in Search Programs and Files at the bottom type Contacts and it should find an entry for the Windows Contacts folder. Click it. – A window will open up and it may already have contacts in it. If it does, create a group and just move them into it so they are out of the way, you can move then back later. – Now select all the contacts and click Export creating a CSV file, call it the name of the group so you can keep track, we went with all the default mapping with the import and export and worked fine. – Now to import the CSV file, Click File > Open & Export > Import/Export. This starts the Import and Export Wizard. – Choose Import from another program or file, and then click Next. 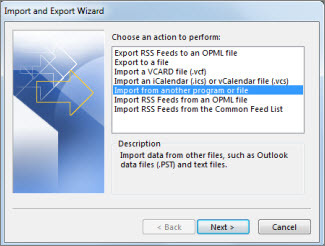 – Under File to import, browse to the CSV file you exported and click Open. – Under Options, choose whether to replace duplicates (existing contacts), create duplicate contacts, or not import duplicates, and click Next. – Under Select the folder to import from, you should see the name of the Group you created, select it and Click Finish. – rinse and repeat for each group you want transferred. – Buy a 6 pack and enjoy it, you deserve it.